Indianapolis' Coyote Armada draws as much from the ivory halls of private, liberal arts institutions as it does from the rusted imagery of failed industry with singer-songwriter Bob Barrick's whiskey-tinged voice and contemplative lyrics playing against a raucous, folk-rock groove complete with banjos, mandolins, violins, and washboard percussion. The group was formed at Butler University in the Winter of 2011 and has since been through several manifestations. Today, it has developed to include lead-vocalist and born-entertainer Bob Barrick, multi-instrumentalist Josh Turner, fiddler Reid Swenson, bassist Craig Middleton, and percussionists Patterson Day & Phillip Janz. 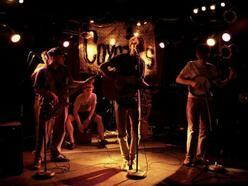 Together, and behind Barrick's unique song-writing, the Coyote Armada released their debut record, the Kye Oats EP, in April of 2013, which was met favorably by fans and critics alike. As one review put it, "The lush, radiant string arrangements that drive [Coyote Armada] are built for those endless summer evenings when the sun hovers in the distance, refusing to rest. Those nights when one beer on the porch inexplicably turns into four," (Musical Family Tree 2013). Today, the Coyote Armada continues to write and record new material as it tours Indiana and the surrounding states. Though, the group has found a returning crowd in their hometown of Indianapolis and, particularly, in the arts community of Fountain Square. As musicians, there is no other life to be lived than the one behind the microphone and this group does not intend to leave it behind any time soon.